Following the debut of his step-daughter as the new Stargirl, Pat Dugan reluctantly created an eight-foot tall robotic suit with which to keep tabs on her. Now her partner, S.T.R.I.P.E. tries to persuade his step-daughter to give up the superhero lifestyle, but even he has to admit to himself that her skills are improving. Pat Dugan was a rarity among comics: the adult sidekick of a teenage hero. Usually it was the other way around, of course, but there was never any explanation for why Stripesy was the second banana, unless it was because The Star-Spangled Kid was rich and he wasn't. Obey the class system, kids! 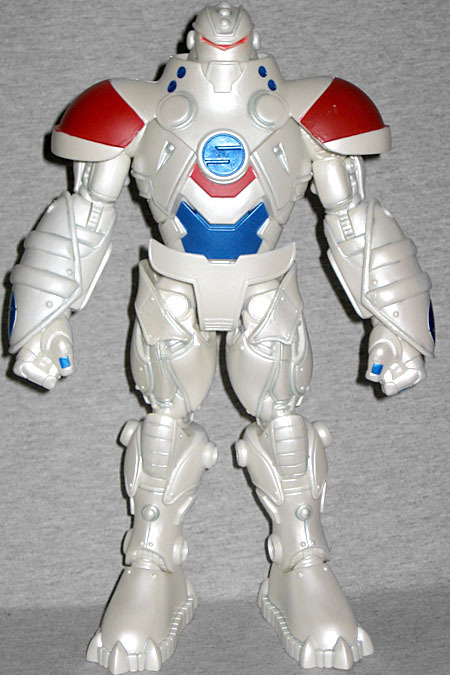 STRIPE is the build-a-figure for DCU Classics Series 19, and comes in seven pieces: head and crotch, torso, arms and legs. There are no variant figures in Series 19, so you shouldn't end up with any leftover BAF pieces if you buy a complete set. That's a nice change of pace for those of us who buy the whole series, but it's a bit tougher on those of you who like picking up cheap BAF bits off eBay: none of the parts are more plentiful than the others. Good luck, penny pinchers: you have a task ahead of you! Once assembled, STRIPE stands 9⅜" tall - that's either a good height or too small, depending on how you want to imagine the suit functioning. If it's a suit of armor that Pat Dugan wears like Iron Man, then it's okay; if, however, it's a mecha he pilots from a compartment in the chest, it's too small. He has hinged rocker ankles, swivel shins, hinged knees, swivel thighs, swivel/hinge hips, swivel waist, hinged torso, swivel/hinge wrists, hinged elbows, swivel biceps, swivel/hinge shoulders and a balljointed head. The thigh joints were pretty well stuck on both legs, which I didn't realize until I had already assembled the full figure - whoops! Fortunately, it's easier (and safer) to pull apart a Mattel BAF than a ToyBiz/Hasbro one. The joints are still very stiff, though. STRIPE has had two major designs over the years: the first seems like a cross between The Iron Giant and The Big Guy; the second was pretty much a direct ripoff of Big O (there's also the JLU design, which we're leaving out for now). This one appears to be some blending of the two, and it looks better than either one of them. The figure doesn't get a lot of paint, so most of his details are accomplished via sculpt. The head seems mostly inspired by the original version, but has the single eyeslit of the update. There's a tall collar around the neck and large bulbous covers over the shoulders. 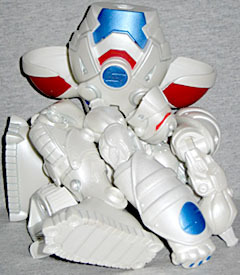 The torso has a very nice angular, layered look, the back of each forearm is protected by an armored pod, and the limbs appear to be functional mechanisms underneath an outer shell. 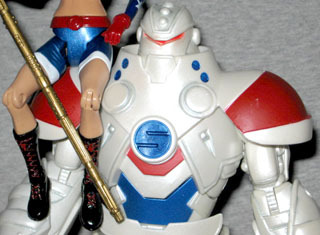 The S logos on his chest and arms are sculpted, much as they were on the JLU figure. The bottoms of his feet have five small rocket boosters apiece, and there are two indentations on the chest that we're choosing to interpret as stabilizer jets as well. Considering that STRIPE was meant to share pieces with Stel, it's a bit amazing how different the two figures really are. Most of the figure is a pearly white - he's not cast in that color, so yes, the entire thing is painted - it's just hard to recognize in most places. There are apps of dark blue and red on the upper body, and a few spots on the body that appear to have a slightly darker wash to create more depth. 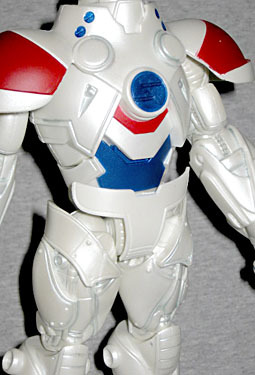 The edges of the color are clean, with minimal paint slop - something that's very important on a figure this stark. 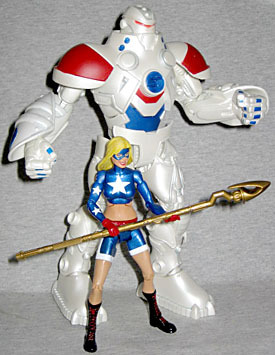 Stargirl has had four action figures, but STRIPE has only had three - DC Direct made a Stargirl (in the same line as Cyclone) but never made her stepdad. This Mattel version is pretty awesome, however, with a cool new Four Horsemen design that manages to completely outshine the comics. This is seriously one of the best BAFs to come out of DCU Classics.